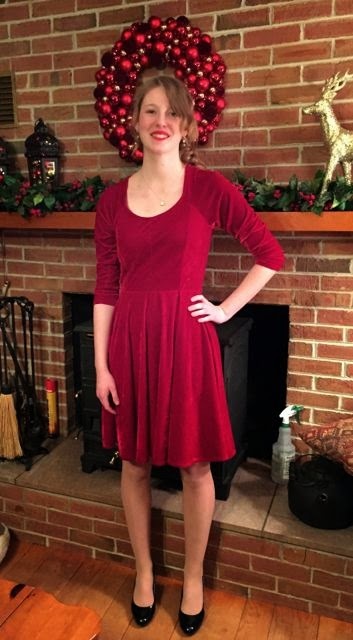 Anyway, my daughter made this dress in early December to wear to the wedding. 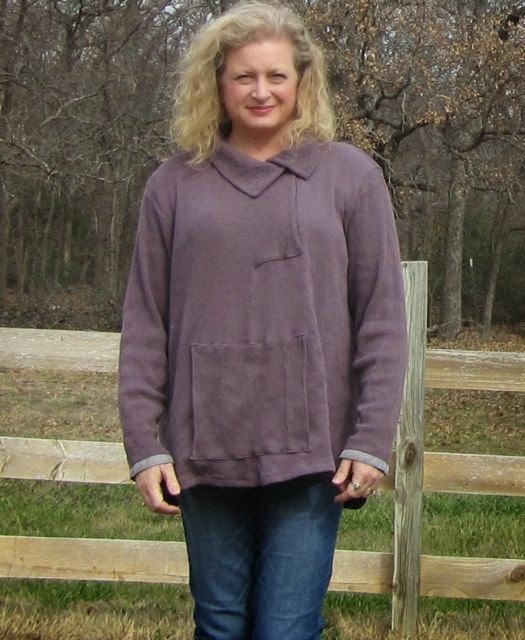 The pattern is McCalls 6754, view D and the fabric is berry stretch velour from Hobby Lobby. The dress on the cover is very short and my daughter is tall (5'9" plus), so we thought we better add some length to the skirt. We tried six inches at first, but that would not fit on the fabric, then we went down to four inches. However, the skirt is quite full and the weight pulls it down, so in the end we only added two inches to the skirt length. The rest of the pattern was sewn without alterations. My daughter made a small (size 8-10). 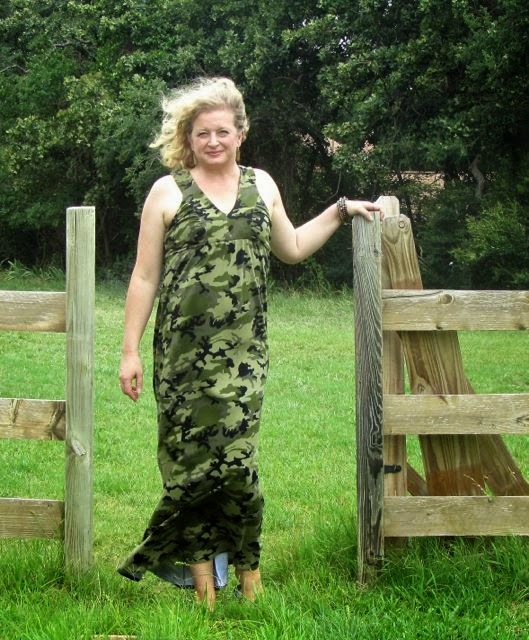 She usually sews a 10. This pattern is rated 'easy' and I would have to say it really is. The whole thing sewed up in an afternoon. It has raglan 3/4 sleeves. The waist seams make a casing for elastic, which helps hold the skirt up. She added knit stay tape to the neckline and the edges of the sleeves and the skirt, then turned them under and stitched them down, using a small zigzag stitch. The fabric does not fray, so the other seams were stitched and pressed open, no finishing required. And it pulls on over the head, so no zippers or other fasteners to worry about. I think it looks really cute on her. The only thing she is not sure about is the raglan sleeves. We both have really broad shoulders and wonder if the raglan sleeves emphasize that too much? Also, the velour sheds on the inside, so after wearing the dress she is covered with bits of berry fuzz. I think that might dissipate with a few more wearings. We do recommend the pattern. You can also make a tank top version for a summer dress, and there are some peplum top variations as well. 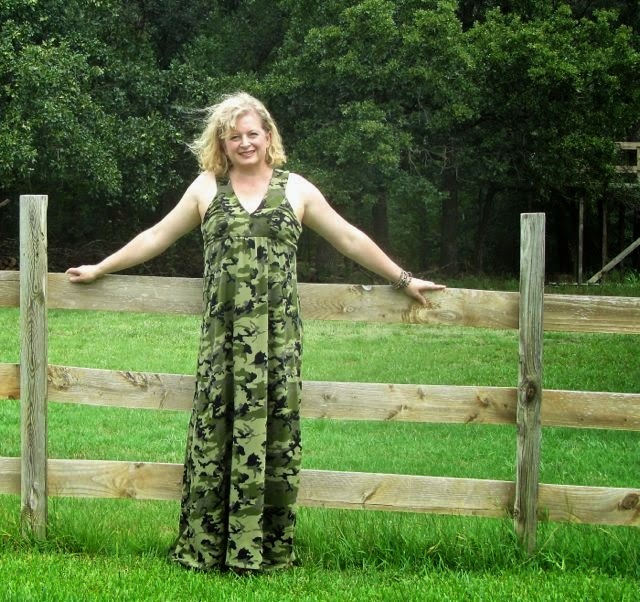 Anyhow, I am a big fan of Carolyn at Handmade by Carolyn, who, as just one of her many talents, has made some wonderful clothing out of scraps and castoffs (for a few examples, see here, here, here, and here). It is because of Carolyn that I now have a large plastic tub filled with discarded clothing that has the potential - maybe - of becoming something else. This top was my first venture. I used Vogue 8854. I've seen several appealing versions of this top made up, some using a more drapey knit, some more stiff. I really wanted to make the hooded version, but as I've said before, when you are making something out of something else, you never have quite as much fabric as you thought you would. In this case, there was an embroidered and appliquéd design on part of both the top and the skirt that was very worn and unsalvageable, and had to be cut away and discarded, leaving me with minimal fabric. So I went with view B instead. As far as the pattern goes, I made a medium, which corresponds to a size 12-14. I did add one inch width to each of the side pieces, tapering out from under the arm. I also added one inch of length to the back hem, tapering to nothing on the side seam so that front and back would still match. I liked that bit of high-low and the longer bottom coverage helps keep my seat warm:) This top has a shirttail shaped hem, which I had not done before, but the instructions on how to do it were excellent and worked, even on this extremely bulky fabric. 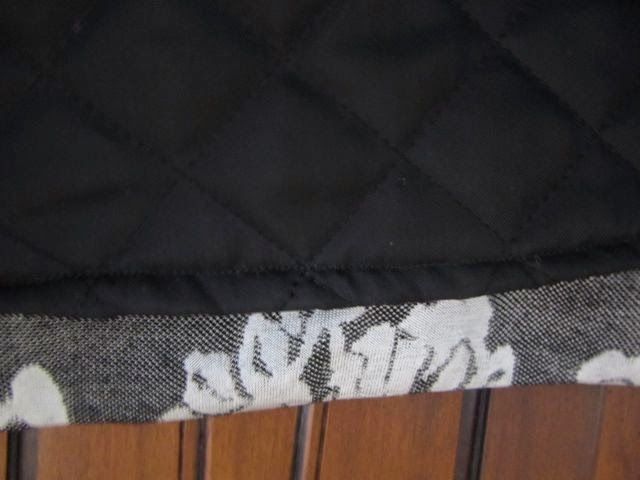 The pattern does not really have a back seam, but I was using the back of the original skirt here. The collar can be worn up or down, but if you plan to wear it up, you probably will need to cut the height down. I have a long neck, and when the collar is extended it is up under my chin. When it is extended you can see the pretty button I used to fasten it, but I omitted the snaps on the collar because 99% of the time, I'm going to wear the collar in the down position. 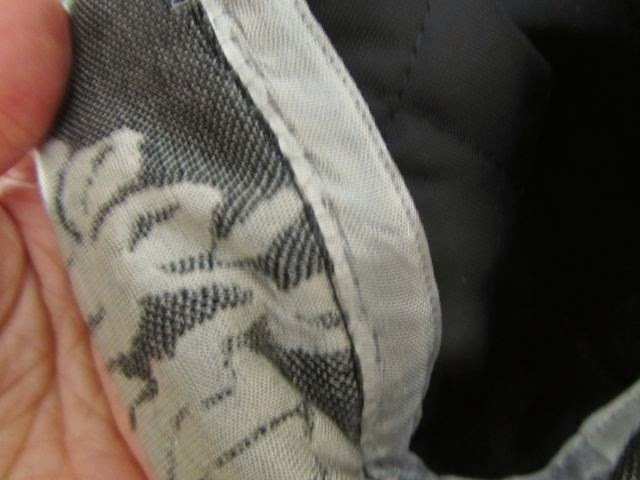 There are two large snaps hand sewn underneath the front flap. It also has a kangaroo pocket, which is a feature I like. 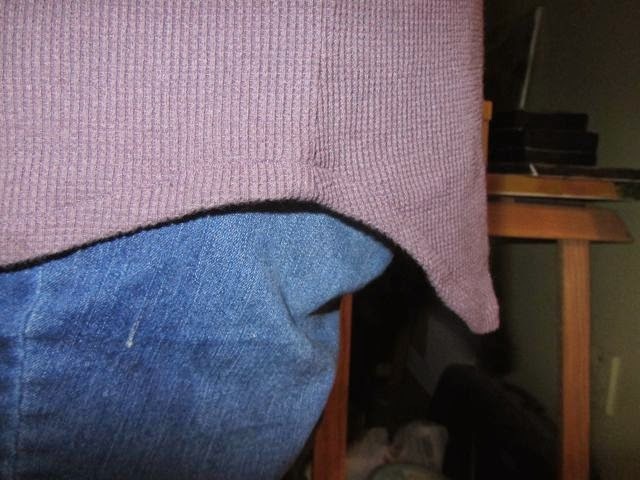 I did lower the placement of the pocket; the pattern had it up quite a bit higher. Because this was an experiment, I decided not to let any wonkiness bother me, instead hoping pretending that it adds a little note of whimsy. This is a very casual top, but hey, sometimes I need that in my wardrobe. 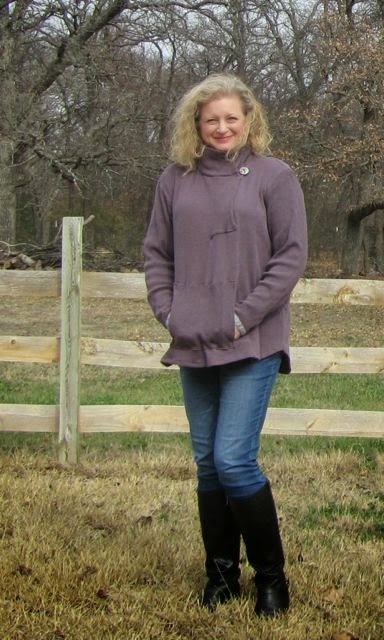 I made three tops last winter: a cozy pullover, a brown leopard print tunic, and this one. I have worn them all a lot, which shows me that tops are worthwhile sewing projects. 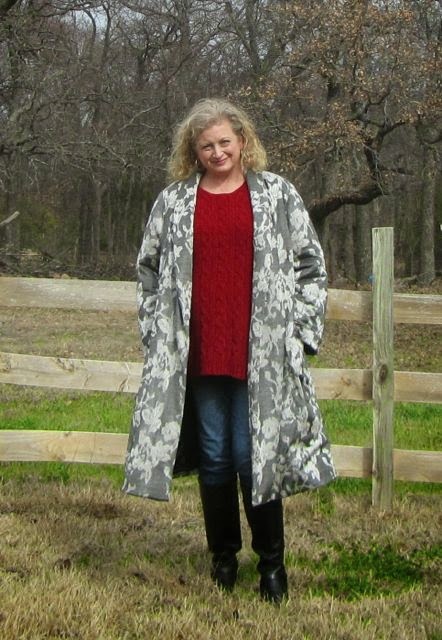 I had planned to make a few more tops this winter - I'd love to try the hooded version of this pattern - but my coat used up all my sewing time. That's okay; I'm trying to enjoy the process of my sewing/crafting and keep it pressure-free. I have to confess that I have just started a project that is definitely NOT pressure-free: a formal dress for my daughter. I will be working on that for the next few weeks -- wish me luck! Finally, after many months, I finished my coat! And I love it! 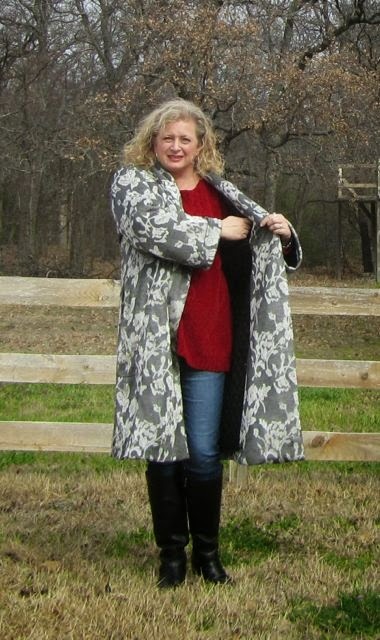 The coat saga began with four yards of a silvery double-knit jacquard-ish fabric I found at my local thrift store for $4. Thrift stores are hit-or-miss, but over the course of last year I happened upon a lot of usable fabrics (like this shower curtain fabric). I didn't know what I was going to make with it, but for $4 it was coming home with me. 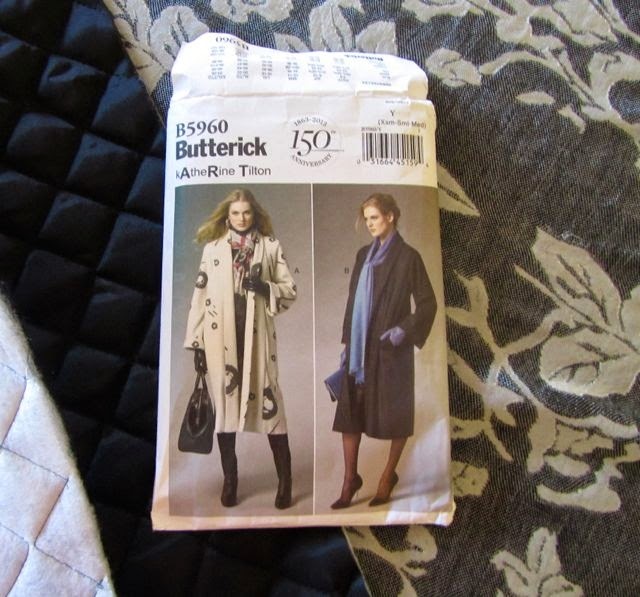 At first I thought a dress, but when I saw Katherine Tilton's coat pattern Butterick 5960, I realized that was what the fabric wanted to be;) I made view B, the lined coat with inside pockets. I made the lining first. I like to do that when possible - it helps me check fit, etc. 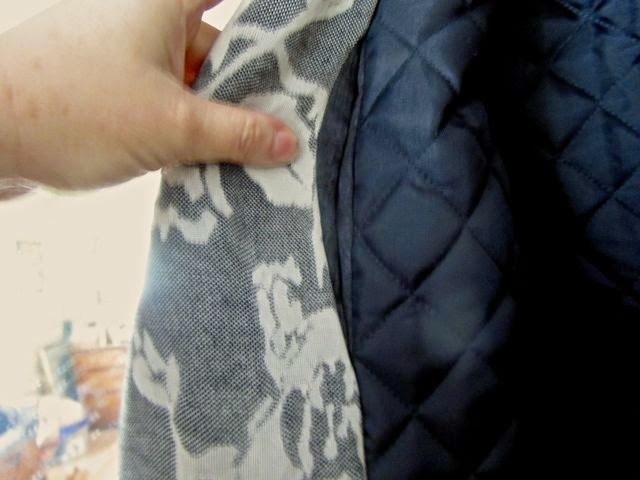 The lining I ordered was pre-quilted and quite stiff, so it functioned as a skeleton for the outer fabric. (A note on this lining: the backing was made of a fusible batting. BE CAREFUL using your iron on this. I did use a press cloth, but I still managed to melt a few spots. Thankfully I caught it before ruining the whole thing, but learn from me - don't use a super hot iron on this). 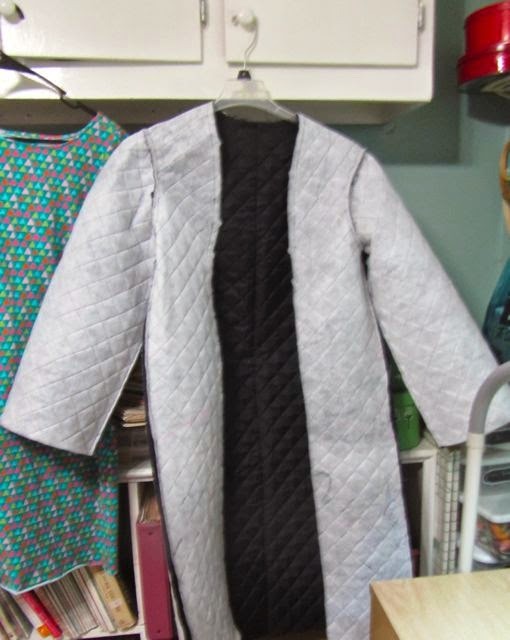 I used a quilting needle in my sewing machine since this was a quilted piece of fabric, and the needle gave me no problems, so I continued to use it on the whole rest of the coat. I was a little afraid of a Michelin-man look, especially in the sleeves, but it is comfortable to wear and also very warm. 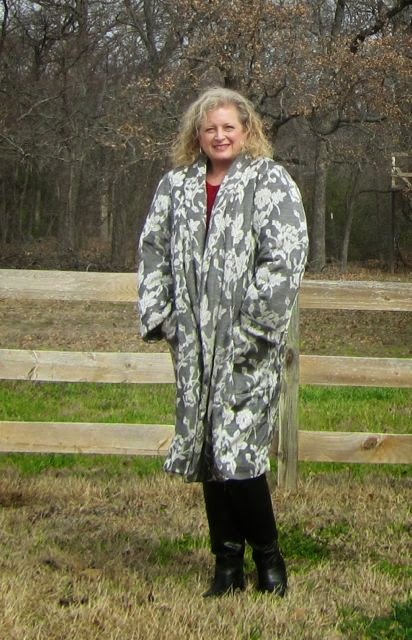 The coat feels very much LIKE a coat, it has a nice heft. Having said that, I do think you could make a great sweater coat using view A, that would be a lot more drapey, but still very attractive. Maybe one of these days I will do that myself. I made a size medium, and the only alterations were to add one inch to the lining length (as per Bunny's advice) and one inch to the sleeve and sleeve lining length (a common alteration for me). 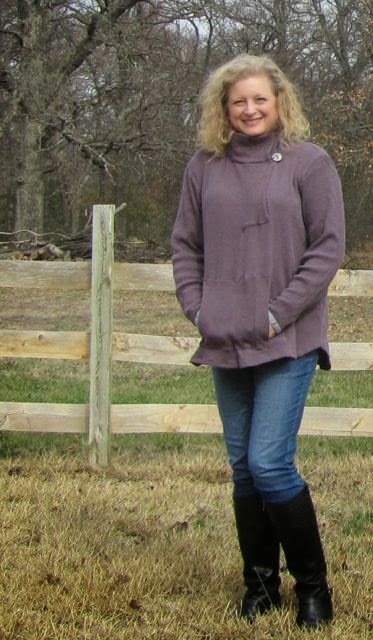 I am 5'8" and normally sew a size 14 in the shoulders plus add width at the waist. This put me at the upper end of the medium size range and I did not add any width, nor did I add any length (which I usually do). It is still plenty roomy and long on me, so if you are on the smaller end of your size range, check because you may want to go down a size. 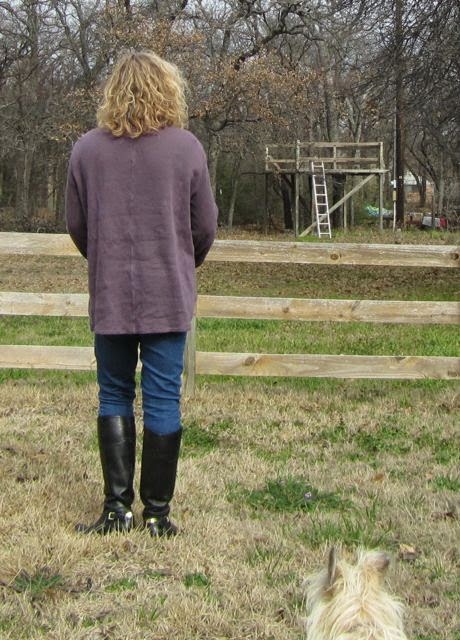 As far as construction went, I combed over Bunny's posts at LaSewista. 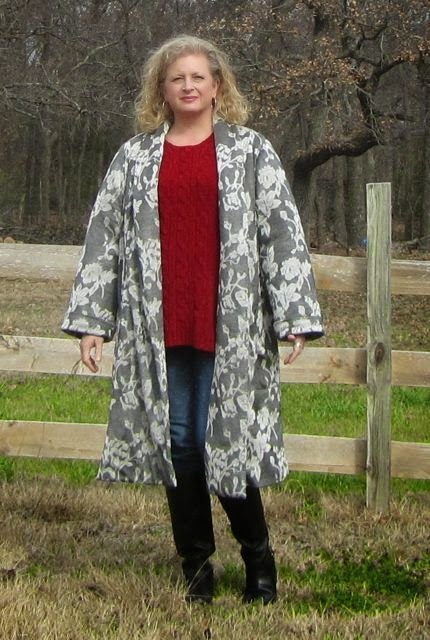 She made a gorgeous cashmere version of this coat last year, and put up a series of construction posts that were very helpful. If you plan on making this, I highly recommend reading her posts - I learned a lot! 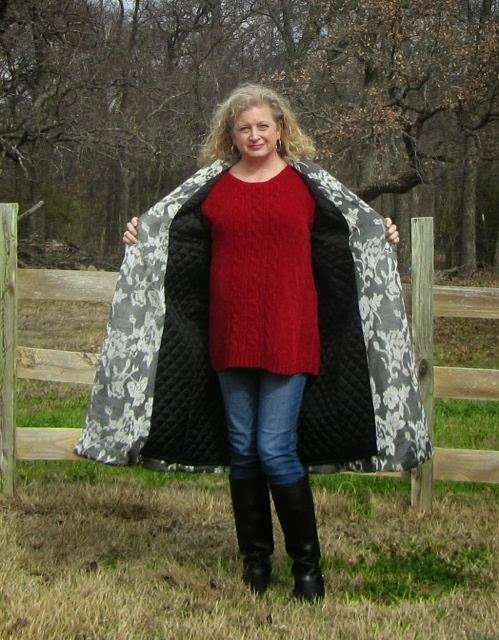 Her coat is much more couture, and mine is definitely not, but I like that you can see that the pattern can look good either way, and that people with very different skill levels and fabric choices can both end up with a great-looking coat. 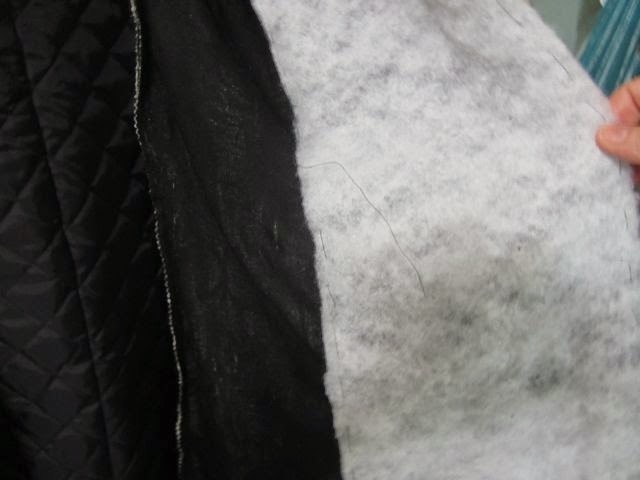 Some construction notes: The front facings are supposed to be padded with wool batting, but I used high loft polyester batting, primarily because I wanted my coat to be potentially washable, although I think I would only hand wash it. The facings are hand-basted in, but I did not find a place in the instructions that had you remove the basting stitches. I did remove mine because they were visible; however, I carefully and as invisibly as I could hand-stitched the batting to the fabric near the fold line because I couldn't figure out how the batting would stay in place without that. (Hmm....it just occurred to me another design option could be to quilt the facings). Here is a view of the completed facings and the lining. The batting really makes the collar feel luxurious and warm. 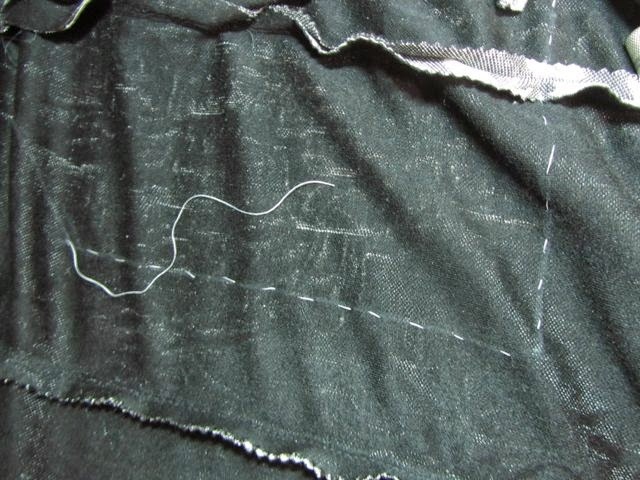 Unlike Bunny, I did put in the hidden upper pockets, using a silky black remnant so as not to add any bulk. I just thought if I were somewhere and didn't want to take a purse, I could very safely put my phone and a few other small items in those pockets. (And they are deep! I have to really reach down to get to the bottom). 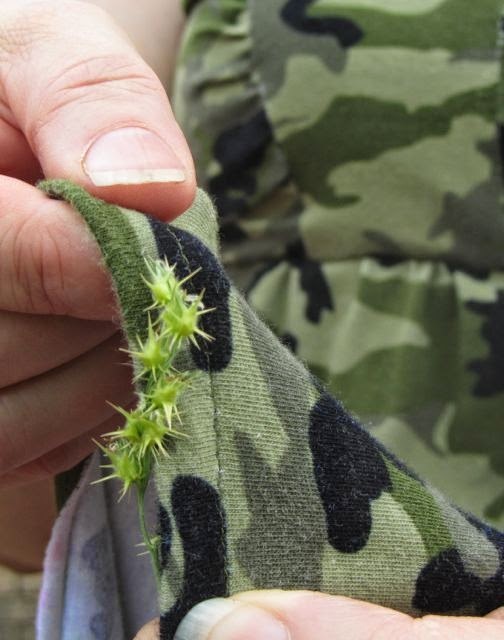 The outside pockets were probably the most complicated part of this pattern, primarily because you can't see what you are doing. You really do have to thread trace them, as Bunny recommended. I can't see how you could mark them otherwise. I'm just glad I was using a print, which is a little more forgiving of slight inaccuracies. There is a place in the directions (step 16) that has you stitch the top and the bottom closed. I just hand-stitched a little bar there, but you don't actually stitch through ALL the layers or you will not be able to get your hand in (thanks for the heads up, Bunny!). I have long arms and my hands don't quite reach the bottom of the pockets, so if you have shorter arms you may want to see if you need to raise them a little. This was a bulky project. Sewing the lining to the outer fabric was like wrestling a bear! I kept all my supplies in a big box on the floor. While the pattern is not necessarily difficult, there are LOTS of markings and you will need every single one. I kept having to get my pattern pieces back out and see what marks I was supposed to be matching up. I stitched and pinked all my seams during construction. I'm sure serging them would be easier (and I got a serger for Christmas! ), but I was already too far in to change methods. The lining hem I turned up and sewed down. I tried doing that with the outer coat, but it was too bulky and left a lumpy ridge. I ended up using some Hug Snug seam binding I already had for the coat and the sleeve hems, which gave them a nice finish. As far as the pattern goes, it is drafted very nicely, although I would add an inch to the lining length so that your lining hem will be sure to cover the hem edges of your outer coat. I did make myself a few notes. On Step 9, DO NOT sew past the square. This is clearly illustrated, but easy to overlook (ask how I know). On Step 16, DO NOT sew through ALL the layers, just through all the FRONT layers. 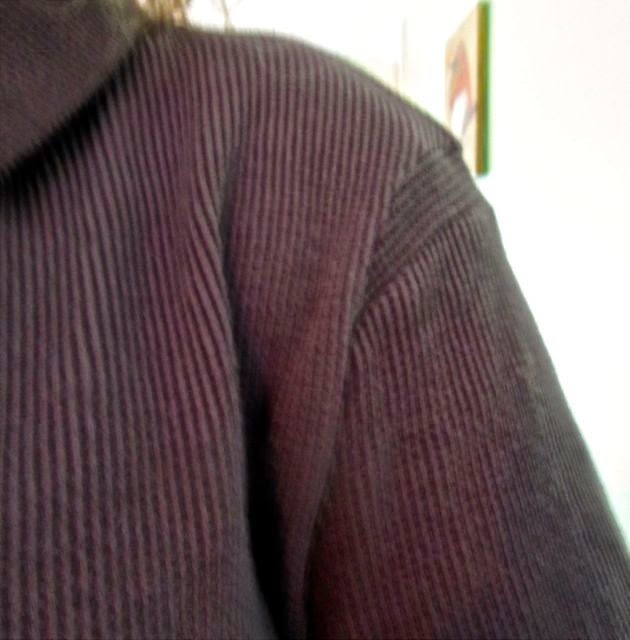 On Steps 20 and 33, when sewing the sleeves in, note that you DO NOT line up the seam lines, you line up the marks, the sleeves are slightly offset. (If you do it wrong, your sleeves will not fit right. Again, ask me how I know). On Step 35 I think it is clearer to say "Stitch one POCKET (9) to each side of side front lining, matching notches and large circles and STITCH one pocket section to each facing section of front." (I added the word "STITCH" in bold). I started this coat in October and quickly got the lining made. 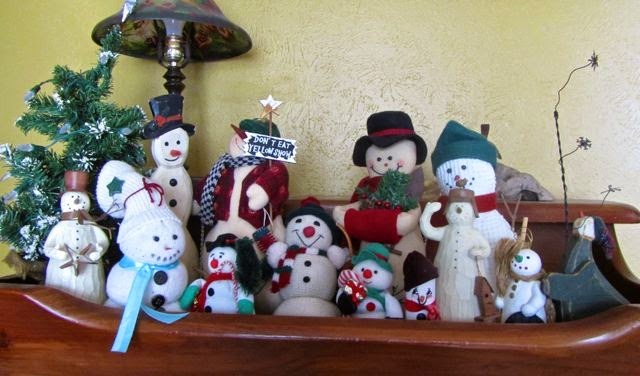 However, November and December saw little to no sewing. I got back to my coat after Christmas and finished it by the end of January. I'm a very slow sewer and I have to sew in bits and pieces of time, which slowed me down a little more because I would have to spend time finding my place. 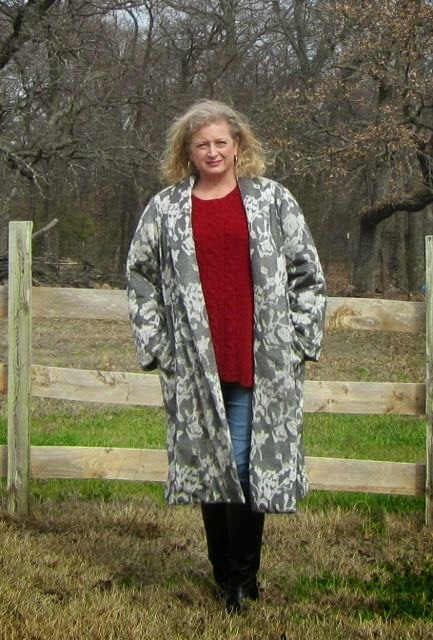 My coat is definitely not perfect, it is not as smooth as I would like where the facings attach to the back hem, but I love it and hope it keeps me warm for many years. 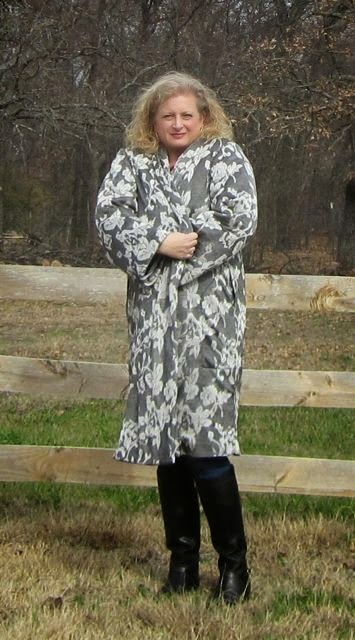 (Also linking up to Share in Style - Japanese Inspiration, hosted by the beautiful and gracious Rosy at sewingadicta). The last few months my life got caught up in a whirlwind. Some of it was good. My daughter played volleyball for a small team, and we spent August through October going to practices and games all over rural north Texas. They mostly played small public schools, a few privates and a few homeschool teams. One school was so small it wasn't even located in a town - just a building in the middle of some fields. This precipitated lots of driving on my part, but as long as the drives are primarily rural, I don't mind. It actually is stress-relieving to be in the car and at the games, because there is nothing else you can do but BE there, all the other pressures and responsibilities of life temporarily melt away. (As an aside, I took one of those little personality quizzes on Facebook, and one thing that rang true about myself that I hadn't previously thought of is that I am a very in-the-moment kind of person. I'm not looking to move on to the next thing; I'm just happy being in the moment I'm in. Which has its pros and cons.......). There were so many things I wish I could have taken a photo of to show rural Texas to you: oil pumps bobbing their heads up and down like some kind of dinosaur relics; wind farms; LOTS of cattle, longhorn and otherwise; LOTS of horses, too. The trees are much less in number here than in the east of the U.S., but the ones we have tend to be low and spreading, majestic in their own way. Rolling countryside, and of course, the big sky. Also, the little towns, often with a traditional square. I enjoyed it all so much, which confirmed that I am definitely a small-town girl at heart. I live NEAR rural Texas, but not really in it. I personally live too close to what I call "subdivision hell", where huge look-alike houses completely cover their lots and are built so close together you could hop from roof to roof, and highways look like mazes and traffic jams are all too daily. There is beauty to be found there too, but getting out and away from all that was a balm to my senses. 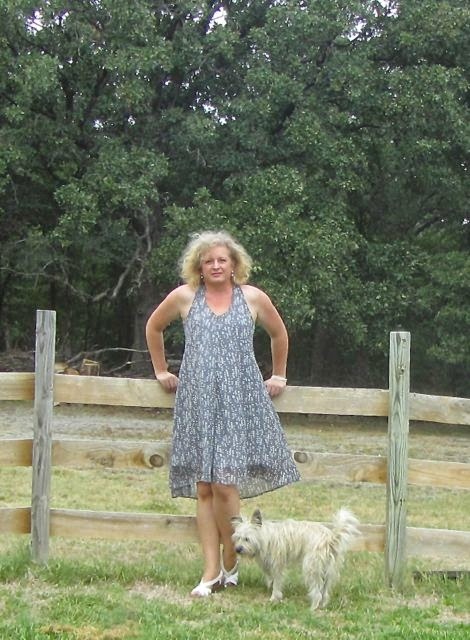 Unfortunately for the blog, I had to enjoy all this rural beauty without any photos, as I was the driver and I was speeding down the highways (one nice thing about Texas is that you can drive fast, speed limits are sometimes 75mph! ), and while the stress was less, there was still a volleyball player pushing me to get to our destination on time: no dilly-dallying!! The volleyball season ended at the end of October in a national tournament in Springfield, Missouri. My daughter, my two youngest sons and I went for a long weekend. Her team won the title for their division in the tournament, which was very exciting and a great ending to the season. I assumed things were about to slow down, but when we returned to Texas, life took another turn. First of all, we had a very disruptive bug infestation, which was a major deal and I will talk about that at some later point. Then, my husband needed surgery, which he had right before Thanksgiving. He is doing fine now, but it was two months before he could eat normally. The first couple of weeks everything had to be liquified, and I was glad I had the Ninja blender! Then, right after his surgery, his dad's health, which has been precarious for several years, started plummeting. My husband did have good talks with him on the phone, but he couldn't go see his dad because he was still unable to travel. Hospice was called in, but less than a week later his dad just went to sleep for a couple of days and then went on home to heaven. This is actually what we were praying would happen. We didn't want his dad to have to suffer in pain, and he was ready to go. However, the memorial service had to be postponed until we were able to travel to Tennessee (and my sister-in-law who lives in Florida could travel), and my other sister-in-law who lives in Tennessee had a son who was getting married right before Christmas, so they rolled the wedding and the memorial service into one long weekend, the weekend before Christmas. Like I've said before, these major life events are spread far enough apart that my two younger sons had grown again and therefore had no appropriate clothes to wear, so they got new suits out of the deal. My daughter made herself a dress for the wedding, which will eventually get blogged, and I wore a lace dress I made a couple of years ago. There were many misadventures along the way and while we were there, which probably best remain unblogged (sometimes family stories need to stay in the family, at least for a few years;). The two-day drive was grueling, and it was also sad because now there is only one grandparent left. But it was good to see family - however briefly - and it was good to hear from so many people who had loved my father-in-law. We wanted to be back home in time for Christmas, so we pushed through and pulled back into town about 2:30 p.m. Christmas Eve. I didn't even go to the house. I had them drop me off at the grocery store and then my husband came back and got me. I rushed around Kroger (along with everybody else in town!) and grabbed stuff to festive up the holiday. I went home and in about an hour made sugared pecans, peppermint bark, sausage balls, fudge, and some other stuff I can't even remember now. Suffice it to say that I amazed myself, even though my family took it in stride! I do think we should consider hibernating during the winter. Everything feels like a slog. Too much death in 2014 for me; too much grief. It is still a bit difficult to look at 2015 with hopeful eyes, instead of wondering what unhappy events lie in wait around the corner. Which is not a good attitude on my part, and not one I want to have! This year I will reach the half-century mark, which is also daunting, mostly because I don't feel like I 'have arrived' or 'have it all together' or anything like that. Thankfully, my hope is not in myself and my coping abilities or accomplishments, but in God who holds all things in His hands. My desire for 2015 (and following) is to find joy in the midst of the uncertainty and the messes and the bumbling along of me in my life. I want to enjoy my family, my home, cooking, making things, working here and there, gardening, friends, church, nature, etc. All these and more are good gifts, and "every good gift and every perfect gift is from above" - James 1:17." There are good gifts every single day. I want to have eyes to see the gifts and the Giver, and to let my heart be glad. 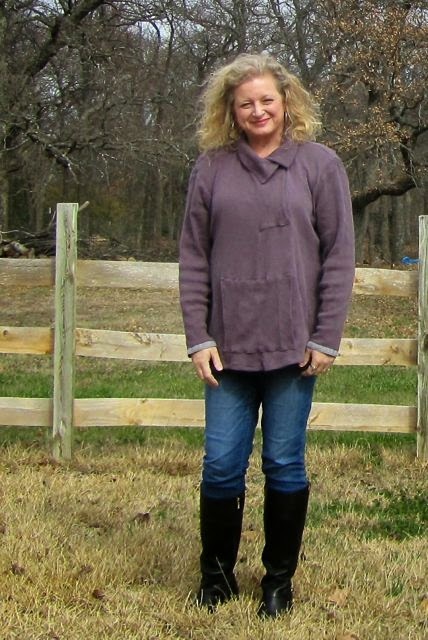 Beverley (also known as BeaJay) of On the Road to Sew Wear has graciously nominated me for the 'Around the World Blog Hop.' BeaJay is a relatively new sewist who has sewn up lots of great Style Arc patterns, many of them especially for workwear. She lives in Australia (where Style Arc patterns are native) and I'm jealous of all the fun get-togethers Aussie sewists seem to have! Anyway, this particular blog hop is more focused on the actual creative process, and if you would like to know a bit more about BeaJay, you can read her answers here. Having just finished a summer dress right at the beginning of fall, I am trying to get ahead of the season (for once) by working on my first coat. 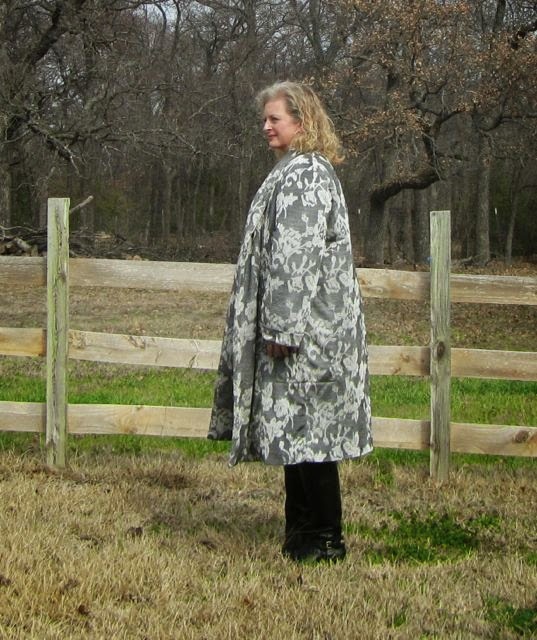 The pattern is Katherine Tilton's Butterick 5960, a duster style with no closures. I know I will wear this style because I have had a similar maroon coat for probably 20 years and I still wear it. 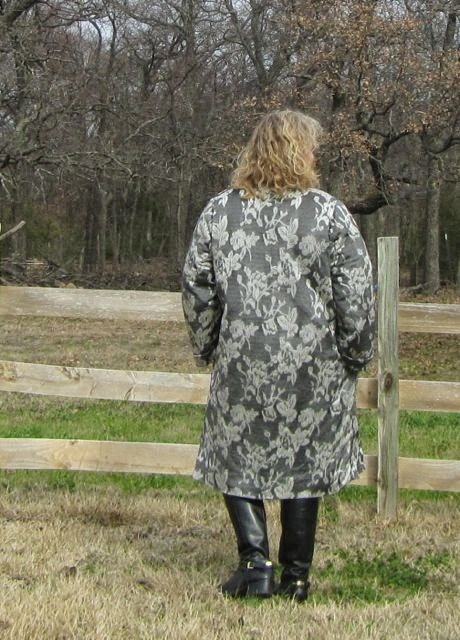 I love this kind of coat over jeans and with boots. 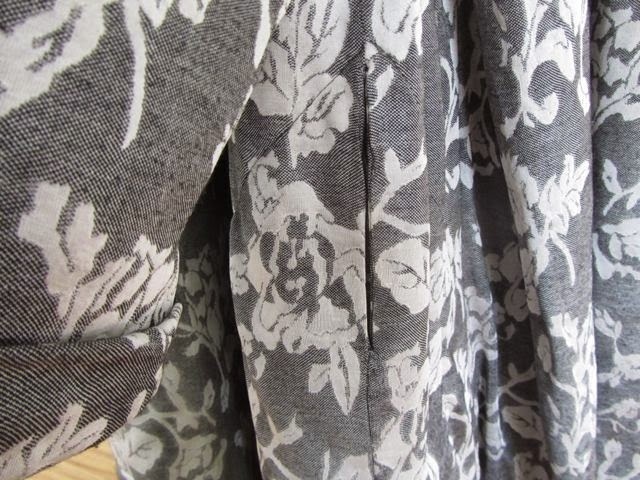 I am using a silver and black rose-printed double-knit ($4 thrift store purchase!) for the outer layer, and am lining it with a black quilted nylon fabric that I bought off ebay. This is somewhat experimental for me, but so far, so good. Not much. 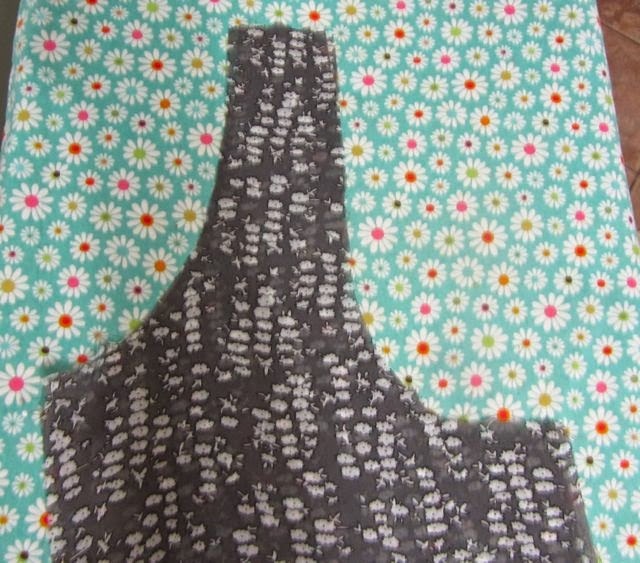 There are lots and lots of great sewing blogs out there. I will say I don't totally consider this to be a sewing blog. I am interested in lots of things -- quilting, crochet, sewing clothing, aging, personal history, travel, Christian faith, cooking, etc. - and I purposely chose a broad title for my blog so that I can put any of that in that I choose. Currently my time is rather squeezed, with five teenagers/young adults still at home, so I have mostly been keeping my sanity by sewing clothes. This is something my daughter and I are enjoying together. I will start with sewing. I come from a long line of creative women. Almost all of them were poor, but they did beautiful needlework, quilting, sewing, cooking, gardening, etc. I grew up believing that what women did was make things and feed people, and on some level that's how I still operate. I knew how to sew but was discouraged by a very temperamental sewing machine. When it finally broke, I began to research blogs about vintage machines (I eventually got a Singer 401A, which I love). It so happens that a lot of vintage machine owners also sew clothing, and from there I became a reader of sewing blogs. What a revelation! There were all these people -- all ages, shapes, styles, skill levels, countries -- who made their own clothing and then wrote about it - with photos! It had been since the early 1990s that I personally knew someone who sewed clothing for adults. Sewing blogs gave me access to a community of technical help, style inspiration, and friendly faces. And finally I lived in a town that actually had a fabric store. So I jumped in! I was already blogging about other crafty things - quilts, bags, toys, etc. However, it was a leap to post about the clothes I was making. If you don't read sewing blogs, then sewing posts (featuring yourself modeling the clothes you've made, no less) might seem a little bit odd. It can feel a little vulnerable and a little exposed. However, I love reading and seeing what others have made, and I love that they are real people with real lives and real bodies. I find that to be empowering, liberating and encouraging. In fact, I rarely read magazines any more because it is so much more inspiring for me to see and read what these real people have been up to. I decided to be as brave as these other sewists. Besides, it is fun to share what I make with others who like to make things. And hopefully somebody will think, "if she can do it, so can I." I start with either the pattern or the fabric, but usually they are not purchased at the same time. The patterns are only purchased during a sale, so I buy any I am interested in then. In general I try to only buy fabric for a specific project, but there are a few fabrics that I just had to have (like here), and the idea of what to do with them comes later. I make exceptions for any usable fabrics I find at the thrift store; I go ahead and buy those. (Despite these policies, I have amassed a considerable fabric stash!) With sewing (unlike crochet and quilting) I am a one-project-at-a-time gal. It just gets too chaotic otherwise and this forces me to finish things instead of giving up when I run into problems (which is almost always:) I am a slow sewer -- I have to work in small bits and pieces of time -- so it takes me awhile to get things done. I also usually take my own photographs, and there can be a big gap of time between finishing an item and getting it photographed. The actual writing of blog posts usually begins with the photos. Then I blather on about the construction details. It may not be the most exciting content, but I try to include information that will help me (and possible readers) if I decide to make this particular pattern again. This is also a good way for me to keep a record of my projects. 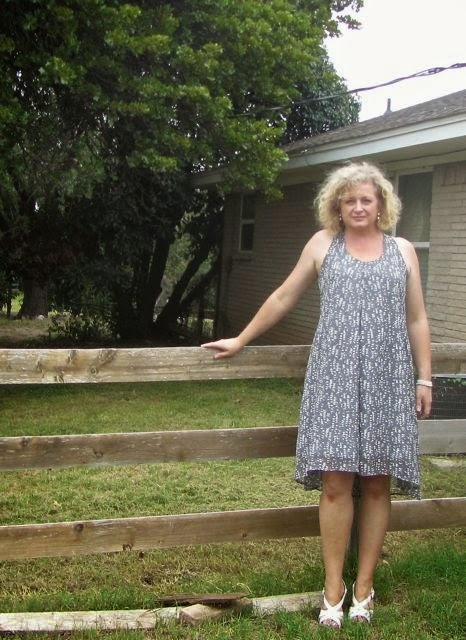 I finished this loose summer dress just in time for summer to be over. That is because things take me WAY longer than I think they will. I have a bit of a self-imposed guideline, allowing myself to sew spring/summer items from March through August and fall/winter items from September through February. However, that last item tends to take its sweet time, so I think I need to back this up and sew for fall/winter in August-January and for spring/summer in February-July. 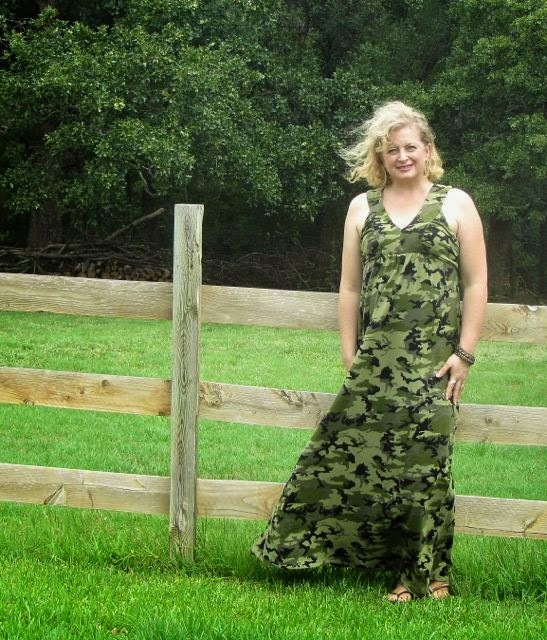 This dress is made from Vogue 8994 - a pattern labeled 'Very Easy.' Patterns labeled 'Very Easy' should come with cautions -- very easy IF not one thing goes wrong. In this case, a lot of things conspired to make it 'Not So Easy.' In defense of the 'very easy' rating, there are only three pattern pieces, a front half and a back half and a back neck band. But they are large. And all the work is doubled because the dress is lined. (That does allow you to use a sheer fabric on top, however). And I did choose to use a sheer fabric, a gray and white crinkled chiffon purchased from fabric.com. Chiffon is not-so-easy to sew; it is slippery and it frays, and you need to use a pressing cloth when ironing it. The one smart thing I did was to soak the chiffon in heavy starch and let it dry (by hanging it over the shower rod). That made it stiff and easy to cut out and relatively easy to sew, and I will definitely be doing that with thin fabrics in the future. I used a Schmetz size 70 universal needle, which worked fine. I lined the chiffon in a silver gray broadcloth from Hobby Lobby. I was going to use white but the gray looked better. The broadcloth is a poly/cotton blend, so not much wrinkling and it's definitely cooler in the heat (which is where this dress will be worn) than straight up polyester. Also, it's washable, all important things to me. In addition to that colossal mistake, I ran into a few other issues. One: if you are anything above a B cup, you will need an FBA. I definitely do not have a figure that normally calls for an FBA (full bust adjustment), but a reviewer on Pattern Review had warned that this pattern was snug in the bust. So when I traced the pattern out I traced my usual size 14 in the shoulders but under the arm I went out to a size 16 and then used that for my side seam. I am glad I did, too -- I needed that extra room, and it was barely enough. Second, the armholes are very low. Maybe not too low for the runway, but if you are an everyday woman making this dress to wear in your everyday life and you don't like your bra showing, then you are definitely going to have to raise the armholes. Unfortunately, because of the way the neckband is constructed, it is difficult to tell exactly how the dress is going to fit until it's almost sewn together. I was almost finished (I thought), but those low armholes were unacceptable, putting the bra band and hitherto unnoticed underarm fat on clear display. It would have been better (and easier) to redraw the armholes higher on the pattern pieces before cutting out the fabric, but it was too late for that, so I had to settle for shortening the front and back. I removed the neck band, raised the armholes by shortened the back by one inch and the front straps by a little over one inch, and resewed everything back together. I probably overcompensated the front bands by a quarter of an inch, but good enough. Third, either the shortening of the back piece resulted in a problem with the neck band or the neck band is drafted too narrow (which is what I think is the problem). The neck band should extend on either side by a 5/8" seam allowance past the back neck piece (step 11). Mine didn't; in fact, it was exactly the same width as my back neck. I rechecked to see if I had made the neck band the right size according to the pattern, and I had. However, it needs to extend. You have two choices: either redraw a longer neck band, or narrow the back neck piece. I chose to narrow the neck back piece because I didn't feel like cutting a new pattern piece, especially since I had already underlined and interfaced my neckband. So I had to take it off and resew the upper back seams (making them more narrow), then reattach the neck band. (I sewed the neck band on three different times -- thankfully the chiffon held on, but it was feeling the strain). The back looks like it's pulling a bit on the left side, so I need to check that before sewing again. Also, the neckband is hidden under my hair. I should have gotten a better photo of it. All of this raising of the back and the front made the neckline too high for my liking, so I lowered the neckline at center front by two inches. This entailed redrawing the neckline curve, which was harder than I expected and made me wish I had a French curve -- it was not so easy to get an exact mirror image. I made view A, which is the shorter length. I am 5'8" and I usually add length, but this time I didn't, and even with the shortenings that happened, this dress is plenty long. Like the reviewer before me, I felt the high-low hem needed more exaggeration for it to look right, and since I didn't have the option of adding to the back hem I redrew the front hem one inch shorter at center front, tapering to nothing at the side seams. That little bit of change made a big difference. I hemmed the dress with a narrow machine hem, enclosing the raw edges. Then I washed the dress to rinse all the starch out. To be honest, I thought I was never going to be done with this dress. And I'm probably not going to get but one wear out of it this year. Up until the last minute I just did not know if I was going to have to toss it despite all the work. It is very tent-like, so if you don't like that, then don't bother with this pattern. But surprisingly I do like it. 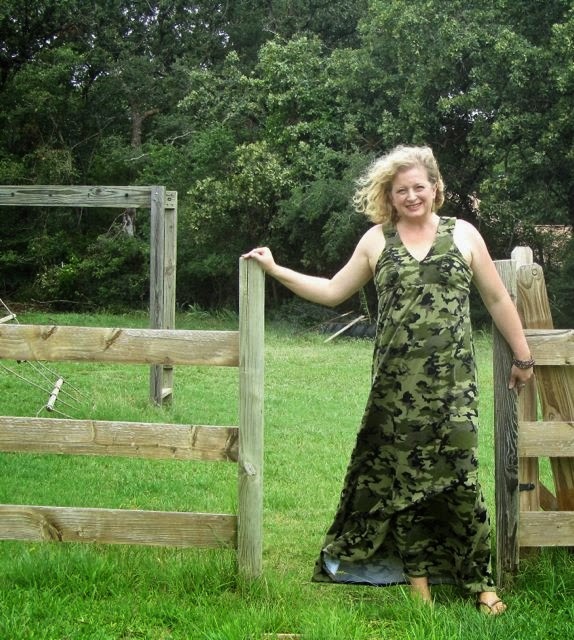 It is good to have a few loose dresses in your wardrobe if you live in a hot climate (like Texas in the summer). I like that it is simple, but the chiffon gives it a slightly floaty feel. It's a pull-over-your-head-and-go dress, which is a plus for me. I think that I ended up with an okay fit. Now, am I going to make it again? Mmmm.......not anytime soon. 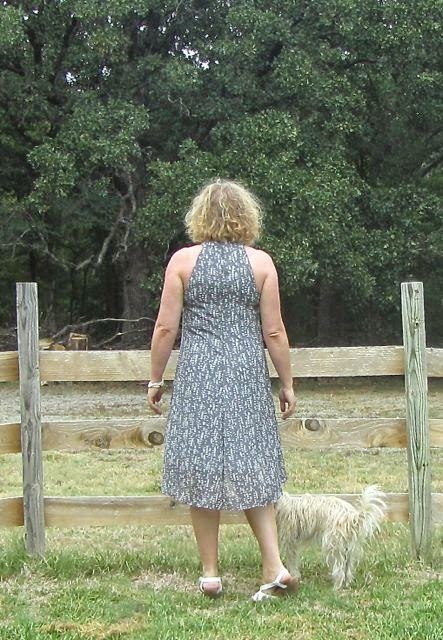 And, fearful of missing the season again, I have gone straight from finishing this sundress to working on a winter coat. 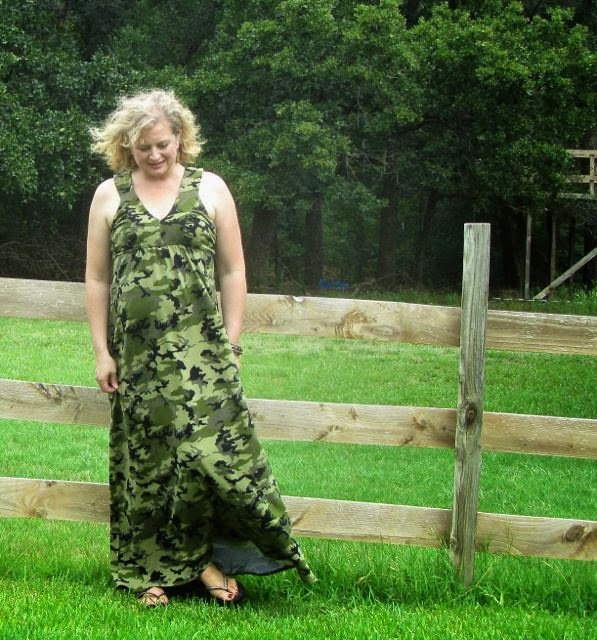 I had a pattern (Simplicity 2219) for awhile now but the holdup was the fabric. 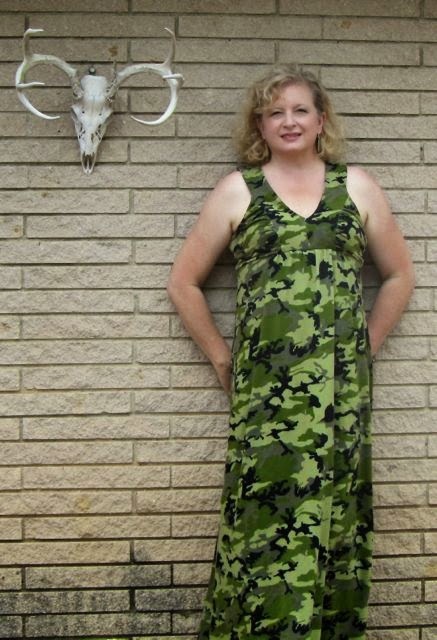 I wanted a decent knit with some stretch and I wanted a particular kind of camouflage (not blue, pink or brown). After much searching, I finally found some fairly hefty cotton jersey from Girl Charlee (sadly, I don't see it on the website now) and ordered it. The fabric was a good price and I thought I ordered extra - so much extra that I could maybe make a T-shirt with the leftovers - but it was 100% cotton and must have shrunk quite a bit during the prewash. And I added two inches to all the skirt pieces. Also, there was a flaw along the selvage edges, which normally wouldn't matter, but I ended up needing all the fabric. Anyway, when laying out your pattern on your fabric, make sure you have enough for the large pieces FIRST. I didn't and ended up having to cut the back skirt upside down. I also had to put a center seam in the back skirt because of fabric shortage. Luckily, in this particular print, I don't think it's too noticeable. I made my usual size 14. I usually add to the side seams, but it was unnecessary for this pattern. In fact, I think it is still a little too big, and I wish I had gone down a size and made a 12. I kept taking in the sides trying to get a better fit. Other pattern changes: I raised the front side pieces by half an inch to insure bra coverage. I will say that there are a lot of pieces to the bodice and it was very confusing remembering which was which. 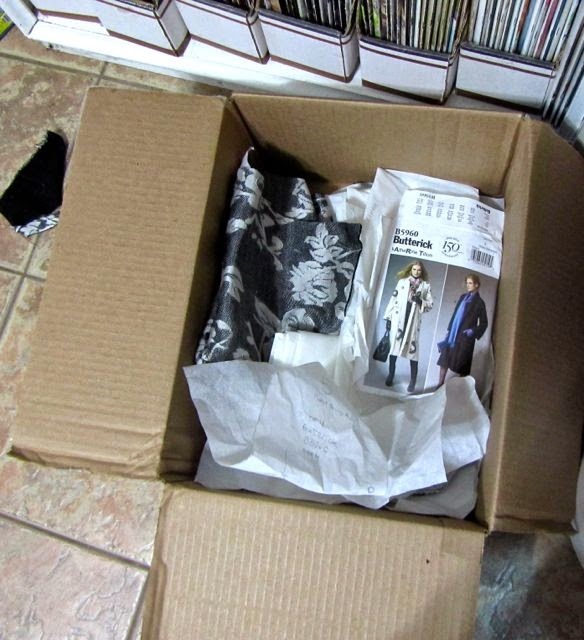 I suggest labeling each piece with a sticky note, especially if you are lining with the same fabric. Someone else suggested skipping the underlining and I second that. I tried to underline but all I did was make a big mess -- it is too hard to tell what you are doing, better just to leave it out. I was hoping the gathered bodice would add a little more shapeliness to my rectangular/cylindrical figure, but I don't think that happened. However, those of you who are a little more buxom may find this to be a very flattering pattern. Despite its flaws, I still love it, and it is a great date outfit for summer outdoors activities (not that I've had much opportunity for said dates this summer, I have to admit). Also, it is so comfortable you could sleep in it ('secret pajamas', right?). 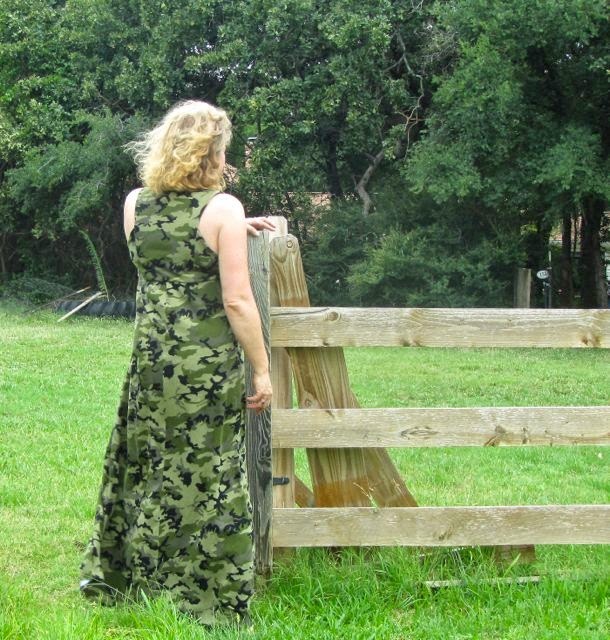 Doing outdoor photo shoots in Texas has its difficulties. The gate behind me has been broken by a falling tree. The wind is picking up here, and I look as if I'm trying to hold on to keep from blowing away. They are everywhere and almost impossible to get rid of. 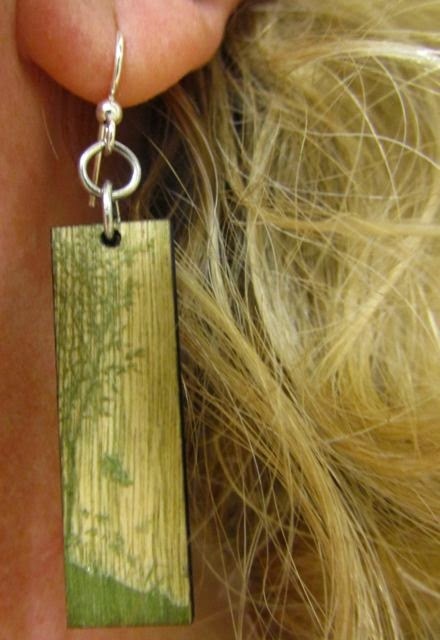 Lastly, a close-up of my wooden earrings from Green Tree Jewelry, an etsy shop discovered by my daughter. Check them out: they have lots of fun, inexpensive earrings and great service.